Nicola Sturgeon says the pledge offers "no guarantees"
Voters will be asked: "Should Scotland be an independent country?" That's all from the Referendum Live team for tonight. We'll be back tomorrow to bring you a comprehensive round-up from the final day of campaigning ahead of the big vote. The Herald leads on calls for a final push with the referendum vote looking too close to call. tweets: Just filed an #indyref story for the morning on the role of technology authenticating record number of postal votes. Enjoy. The Scotsman reports on its latest poll, which shows the Yes and No sides still only a few percentage points apart. The Daily Mail, in its front page, alleges intimidation of No voters by Scottish nationalists. The Daily Telegraph leads with a story alleging First Minister Alex Salmond bullied an academic from St Andrews University over the independence referendum. The Guardian features the story of the NHS leak, with comment from James Naughtie. The Times carries a story about David Cameron facing some angry Conservative members at Westminster over his plans for Scotland. The Daily Record's front page for tomorrow features current First Minister Alex Salmond and Donald Dewar, Scotland's inaugural First Minister. The Sun newspaper, in its front page tomorrow morning, says to Scots 'Your voice, your choice, your vote'. Responding to Mr Neil's claims, Scottish Labour health spokesman Neil Findlay dismissed the Health Secretary's position as "absolute fantasy". He said: "This is more like a crisis document. Alex has been hiding half a billion pounds in cuts - when was he going to tell us about this? I wouldn't trust him to open a box of elastoplast." John Brown wrote: Undecided voters should watch and learn as Yes supporters display the 'fair and open' society they profess to want by verbally abusing and shouting down anyone whose views they do not want to hear. They have done it time and again in this campaign; from politicians to journalists to anyone else they disagree with. Don't let our country set foot on the slippery slope of nationalism. Linda Hall emailed: Does anyone out there really believe that Cameron/Miliband/Clegg, even if they wanted to, are capable of delivering on this absurd pledge for more powers for Scotland post the 18th? Their backbenchers will never ever wear it and it will disappear into the Westminster long grass and life will just return to normal, which is what we get if we vote No. Health Secretary Alex Neil has accused former Prime Minister Gordon Brown of "talking mince" about the future of the NHS in Scotland. Speaking on Scotland 2014, he also claimed the documents shown to the BBC detailing a £400m funding gap at NHS Scotland had been available from health boards since the budget was passed in February. He said: "This is not cost cutting, they are efficiency savings and the difference between north and south of the border is we reinvest the money in the health service." The Sunday Herald political editor Tom Gordon reckons that after the three polls tonight the Yes side "need to convert about 70,000 No voters to win (on 80% turnout)". is the pledge signed by David Cameron, Ed Miliband and Nick Clegg to devolve more powers to the Scottish Parliament in the event of a No vote, and a promise of sharing of resources and preserving the Barnett funding formula. The Barnett formula is the method used to determine the distribution of public spending around the UK. However, in an interview with BBC Radio 4's World Tonight programme, Lord Barnett, who set up the system in 1978 when he was chief secretary to the Treasury, said it was "grossly unfair" and repeated his call for it be scrapped. Alex Salmond told David Dimbleby he believes the overwhelming view of people in England if Scotland gained independence would be to "wish them well" whether they agreed with the decision or not. Alex Salmond told David Dimbleby in his TV interview he believes negotiations can be positive following a Yes vote. "This is the land of Adam Smith and he developed the concept of enlightened self-interest," he said. "Smith said that deals were done and struck and people acted economically because of their self-interest which could contribute to mutual self-interest. "England is Scotland's largest trading partner and Scotland is England's second largest trading partner after the USA. "Therefore it is in self interests of both Scotland and England and the rest of the UK to get on with each other." Three new polls, by Opinium for the Daily Telegraph, ICM for the Scotsman, and Survation for the Daily Mail suggested the "No" vote held a slender lead going into the final day of campaigning. With undecided voters excluded, all three polls suggested a lead for No of 52% to 48%. The full breakdown of the Opinium poll was 49% for No, 45% for Yes and 6% undecided, while the ICM survey was 45% No, 41% Yes and 14% undecided. The Survation poll had Yes 44%, No 48% and Undecided 8%. The former US President Bill Clinton has urged Scots to vote No in Thursday's independence referendum. In a statement released by the Clinton Foundation, he reveals why he wants Scotland to remain part of the Union. He said the proposal to keep the pound as its currency without the support that UK membership provides carries "substantial risks" and adds separation will "require a long complex negotiating process with considerable uncertainty and potential to weaken the Scottish economy". He also argues "the increased autonomy promised Scotland by the UK provides most of the benefits of independence and avoids the downside risks". He concludes: "Unity with maximum self-determination sends a powerful message to a world torn by identity conflicts that it is possible to respect our differences while living and working together. This is the great challenge of our time. The Scots can show us how to meet it." The latest news and analysis ahead of Scotland's vote on independence on 18th September - presented by Sarah Smith in Glasgow. Alex Salmond tells David Dimbleby independence is not risk-free. "Every country has problems, issues. Every country will make mistakes," he said. "I think the difference with independence is it will give us the ability to overcome problems and to correct mistakes." Humza Yousaf MSP and Danny Alexander MP have been answering the questions of young voters on a variety of issues including the armed forces and unity post-referendum. Alex Salmond on the plans for more powers to the Scottish Parliament: "Nothing like home rule, it's nothing like devo-max, it's not even devo-plus. "It is actually an insult to the intelligence of the people of Scotland. "To re-hash these proposals last gasp in the campaign and hope beyond hope that people'll think it's anything substantial. It is not." First Minister Alex Salmond tells David Dimbleby: "It is too early for congratulations of any kind, this campaign has got two days to go. "We are working flat out, we are still the underdogs in my estimation because Westminster has a huge amount of ability to fling kitchen sinks, half the living room and probably some of the bedroom at us." Gordon Brown on whether this was a last stand against independence: "I don't think so. I think tides of opinion rise and fall. We have had to modernise the United Kingdom and in particular Scotland's role in it for the 21st century. "The United Kingdom has an ability to evolve and adapt." Issues that have been discussed on the Radio 1 debate include tuition fees and the NHS. You can listen now, watch on the BBC News Channel, and take part in the discussion. Gordon Brown tells David Dimbleby: "If you go independent you throw away something that is irreplaceable." "It takes time for people to get the message that there is change coming, change is definitely coming," former PM Gordon Brown told David Dimbleby. "It is a stronger Scottish Parliament that is part of the United Kingdom but we don't lose what we have got." On the Radio 1 debate, Humza Yousaf from the Yes camp says: "Common sense will dictate." The SNP MSP adds: "It doesn't matter if we have a currency union, we can create jobs, protect the NHS, increase the minimum wage - that is the power I want for your generation." But Danny Alexander from Better Together says: "For the rest of the UK, you've got to think a currency union would mean taking a risk on Scotland without having control over policies. The only way to keep the pound is the keep the UK together." Read all the latest from the live Radio 1 debate. Former PM Gordon Brown on the Scottish people: "They want change but, in the end, I don't think they want to break all the links. "I am trying to persuade them that these links remain important to them." On the Radio 1 independence referendum debate, young voters and politicians are discussing the issue of currency. You can watch it now. Former Prime Minister Gordon Brown, speaking on The Dimbleby Interviews on BBC1, has outlined why he believes remaining in the union is the best way forward for Scotland. "In every generation we've got to find a way of combining this strong sense of identity that exists in each nation with the desire, I believe the willingness, to share as part of a United Kingdom," he said. "No set of countries in the world has managed to do what we have. "It is the most successful multi-national partnership in history and that's why I want to keep it but I want to keep it because I know also it has got benefits for each of the nations." Former prime minister Gordon Brown is being interviewed by David Dimbleby on Panorama. Do you subscribe to the view Scotland can survive and prosper as an independent country? Mr Brown said: "I would hope that under any circumstances, my country, Scotland, would do well. But it would not do as well under an independent Scotland." Opinium/Daily Telegraph poll of more than 1,000 Scots shows "No" ahead with 52% of the vote and 48% for "Yes" with one day to go. With the undecideds included, the split was 45% Yes and 49% No and 6% Don't know. @Neil_FindlayMSP on the programme tonight. Join us at 10pm on BBC Two Scotland. David Dimbleby questions two of the key protagonists of the referendum debate at 21:00. At 21:00, Radio 1 will host its Big Conversation on the Scottish independence referendum. Hosts Edith Bowman and Chris Smith join young voters and Danny Alexander MP from the Better Together campaign and Humza Yousaf MSP from Yes Scotland. You can watch the debate live and follow it on our special live page. First Minister Carwyn Jones has assured AMs. The three main UK party leaders have pledged to keep the current funding system for the devolved governments. In a letter in a newspaper they promised to keep the Barnett formula if there is a Scottish no vote this week. But Mr Jones said Mr Miliband had "made it clear" he would deal with Wales' funding issue if he wins office. About 1,500 pro-independence supporters bearing Saltire flags, badges and blue campaign T-shirts are taking part in a rally in the heart of Glasgow. Rank-and-file Yes supporters have been using megaphones in George Square to declare "This is our time" and chant "yes, yes, yes, yes". Some of the crowd have been singing Flower of Scotland and songs by The Proclaimers. It follows a pro-Union rally held in central London on Monday. Today's referendum round-up is brought you by the words vow, scrum, cupcake and photo-bomb. As the polls narrow in the Scottish independence debate, banks, investors and economists have been ramping up their warnings about the potential investment and economic impact a break-up of the United Kingdom could have. But some commentators believe that, while all the uncertainty surrounding the details of separation may have negative economic consequences in the short term, an independent Scotland could be financially viable in the longer term. Here is a representative selection of recent comments. during an interview on Newsnight that a post-Yes Scotland would have to adopt the Euro if it was an EU member. The Yes campaign wants to keep sterling, and has insisted that Scotland would be welcomed into the EU after independence. A spokesman for Yes Scotland said: "After a Yes vote, the Scottish government will have discussions with the Westminster government and the EU to agree a smooth transition to full membership on the day Scotland becomes an independent country in March 2016." But Scottish Conservative MEP Ian Duncan said: "The Scottish government has to be honest with the people of Scotland and answer this question - why would European Union member states such as Greece or Spain allow an independent Scotland to opt-out of the Euro, when they are obliged to use it as currency?" Alex Salmond told the BBC's Jackie Bird: "We are not aiming for a majority of one, as the underdogs in this campaign to secure every possible vote to persuade our fellow citizens that this is the opportunity to take Scotland's future into Scotland's hands. "In terms of challenges, of course we will have challenges, every country does. The point about independence is having the powers and the ability to overcome these challenges." Mr Salmond repeated that Scotland would use the pound after independence. He said: "We think there will be a currency union because the mandate of the Scottish people is going to be for that and, of course, it is in the best interests of Scotland and the rest of the United Kingdom." Mr Salmond added: "We are going to have a common sense agreement on a common currency and the Bank of England will be the shared Central Bank. That's our proposal." First Minister Alex Salmond said: "If the No campaign's argument is that we should increase taxes so we can compensate for the Tory cutbacks at Westminster we end up paying for the health service twice. "Far better if we are going to cut things, let's cut Trident missiles or the House of Lords or the House of Commons. "This underlines the point. To control the health service you have to control the finance and the administration. That's why it is safe in an independent Scotland and under-pressure as long as we remain under Westminster control." Alex Salmond told Reporting Scotland: "All that money from health service savings is reinvested in the budget, which is why it is increasing in real terms and will continue to do so across this year, next year and the year after in terms of frontline budget." Scotland's First Minister Alex Salmond told BBC Scotland's Reporting Scotland programme there were no cutbacks to the health service. He said: "They are not cutbacks, they are cost-pressures in the health service. What are these cost pressures? The vast majority of them, that's the pensions, the withdrawal of the National Insurance rebate, are money that our health service is going to have to pay for Westminster to the Treasury because of changes they have made in how the health service is funded. "So we are going to have to give money to the Westminster exchequer, of course that creates pressures but how much better would it be if we had the finances of the health service in Scottish hands? "Let me repeat, there will be no decrease in the health service budget." Mr Darling concluded his interview by defending the Better Together campaign, which has seen a comfortable lead in the polls decline in recent weeks. He told Reporting Scotland: "Having visited places up and down Scotland, having talked to countless numbers of people, what I do know is people want change. There are two competing visions of change." Mr Darling also hit out at the Yes campaign for the amount of unanswered questions with only two days to go until the vote. He said: "There are huge, unquantified risks, unanswered questions. Two days before the referendum, and we still don't know what is going to happen with jobs, with firms moving their headquarters south of the border, who is going to pay pensions, what is going to happen in Europe, what currency we will be using. "All those risks are massive risks to families, to people's standards of living, and our ability to fund things like the health service." Mr Darling argued: "People used to say before 1997, before the then Labour government legislated to set up the Scottish Parliament, they said: 'Oh it will never happen, you will never get it through'. Well, we did and since then its powers have been further strengthened. " On Reporting Scotland, Mr Darling said: "They (voters) are faced with a choice between having a secure Scottish Parliament which you can set up faster in a more secure way, a better way of proceeding than years of uncertainty that would follow trying to negotiate the break up of the United Kingdom never mind the complications with Europe and so on." He added: "My argument is you can have a strong Scottish Parliament within the United Kingdom that secures funding for things like the health service, but if it wants to raise more money to put into the health service it can do so. Either way it has got complete control over the health service." The leader of the Better Together campaign Alistair Darling has defended the pledge to offer more devolved powers to Scotland and criticised the SNP on the NHS. In an interview on Reporting Scotland, he said: "They (the yes campaign) are bound to have a go at a policy that they know the majority of people in Scotland want. I think most people in Scotland want to have a Scottish parliament with strengthened powers, being able to raise money to put in the health service for example. "We know it is an issue that is of key concern to voters in the referendum, especially on a day when we find out the Scottish government is planning on taking £450m out of the health service budget and they weren't going to tell us until after the referendum. We only find out because someone has leaked documents." Sunday Herald told the BBC that the city of Glasgow was crucial to the independence vote. He said: "It has long been said that the road to independence runs through Glasgow and that's for a number of reasons. "One in nine voters in Scotland lives in this city and there are two other big groups of people - Labour supporters and people who just don't vote, there were five constituencies in Scotland where turnout was below 40% and they were all in Glasgow. "So if the Yes campaign can crack Glasgow, if it can convert Labour supporters and motivate non-voters, they are probably on to a winning formula for the rest of Scotland as well." with mum and son voting No, and dad and daughter voting Yes. questions what Trident could look like in a Scotland with more devolved powers. Yes supporters have turned out for a rally in Glasgow's George Square. Many Tory MPs that I have spoken to today are angry - angry that the Prime Minster has put the union at risk, angry that he is offering Scotland so much. If Scotland votes Yes, some will demand David Cameron's head. If Scotland votes No, they will demand more powers for the English. David Cameron says he is not remotely at the stage of thinking about an English Parliament but some in his party are ready to go into battle for one. The debate about self-determination in Scotland is almost over, in England it has only just begun. Ed Miliband accused the pro-independence campaign of "ugly" tactics after campaigners hurled abuse at him in chaotic scenes during a visit to Edinburgh. Mr Miliband told the BBC: "I think we have seen in parts of this campaign an ugly side to it from the Yes campaign. "I think debates should be conducted in a civilised way, I think that's very, very important, but I understand that passions run high. "What I've enjoyed about this campaign, including today when I get the chance, is meeting people who are genuinely undecided." It is an intriguing element to this last couple of days. On the issue of plausibility, those who support independence say this cannot be guaranteed to go through. They say in the event of a No vote, the atmosphere would change, that there are grumbling Conservatives on the backbenches of Westminster who distrust new powers for Scotland. Supporters of this plan say that all of that is trumped by the fact that it is the three big parties at Westminster - Conservatives, Liberal Democrats and Labour - jointly agreeing to put this forward. Referendum Tonight on BBC Radio Scotland is your late night round-up of the day's events from the campaign. Andrew Black will be looking back on today's stories, speeches and debates and looking ahead to what we can expect from the final day of campaigning. We'll also have perspectives on the debate from Iceland and from Ayrshire. Referendum Tonight is on 810 medium wave and on digital radio between 23:00 and midnight. 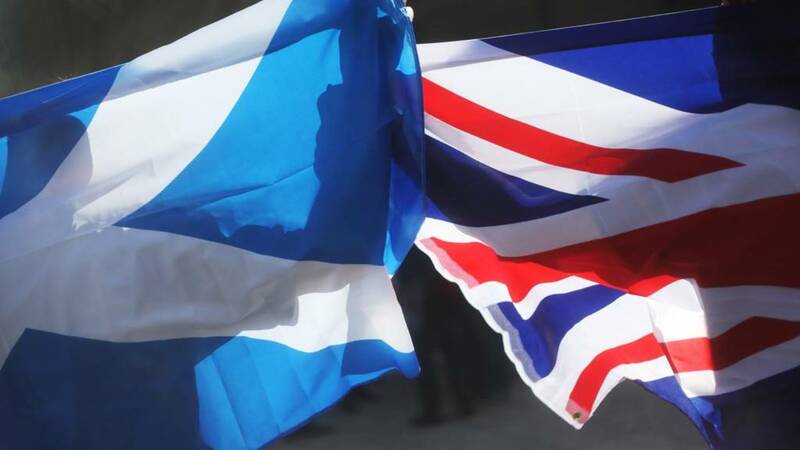 Over 60% of adults in England and Wales think Scotland should remain part of the union, a new poll has revealed. The TNS poll asked 1124 people over the age of 18: "Do you personally think that Scotland should become an independent country?" 18% said Yes, 63% said No and 19% said Don't Know. 55% of those who took part in the poll say they care about the outcome of the referendum, while 47% say Scottish independence would have no impact on their lives. There have been a number of Conservative MPs at Westminster who are a little bit perturbed - let's put it no more strongly than that. They are a little bit perturbed that they see these extra powers being offered to Scotland when it has not been discussed in the Westminster parliament and they think that not enough consideration has gone into this. That said there are some MPs, such as the Labour MP Graham Allen, who has done a great deal of work on looking at constitutional change - in fact he heads a select committee at Westminster which looks at constitutional change. When I was speaking to him this afternoon he said he believes that the extra powers which are being offered to Scotland are a very good thing because he thinks it will lead to extra devolution throughout the rest of the United Kingdom. that the reported £400m to £450m in cuts to the Scottish health service was "not being contemplated". He said: "What is being contemplated are 3.5% efficiency savings so that we prioritise where we spend the money. So any money saved will be reinvested in the frontline services of the NHS in Scotland. "We have been doing that for years. They have been doing it down south but they don't reinvest the money in frontline services. We do." The Scottish Government's Health Secretary Alex Neil told BBC News: "We have not been lying to people at all. "We are not going to be cutting the NHS budget. We have passed a budget for this year and we have published a budget for next year and both of those show a substantial increase in spending for the NHS. "We are under pressure because of the cuts in London, which is why the budget for the NHS should be set in Scotland and not determined as a percentage of the health budget in England." There are very few specifics in this pledge but I think it is more important that it is the three leaders signing a pledge which is on the front page of the Daily Record newspaper this morning. That gives them very little wriggle room if there is a No vote to try and in any way resile from that in the future. Scottish Labour MSP Jackie Baillie told BBC News: "Just imagine if you woke up on Friday having voted Yes to then be confronted by a substantial package of health service cuts delivered by the SNP." She added: "What we are promising, if people vote No on Thursday, is a package of powers that is far safer than risking independence. Within those powers is the power to raise income tax. I am genuinely of the view that guarantees the funding of the NHS." Labour's Jackie Baillie told BBC News: "What we have seen today is the SNP's biggest lie of the entire referendum campaign completely exposed. "They make claims that you have to vote Yes on Thursday to protect the NHS yet quietly in secret back-deal rooms across Scotland what we have is the SNP secretly planning £450m-worth of cuts. "That's cuts to frontline services. That's emergency services in my local hospital and in hospitals across Scotland." Yes campaigners Business for Scotland say they have reached "a membership milestone". The organisation said 500 more people had signed a declaration backing its stance in the past month, bringing the total to more than 3,000. Recent signatories, it said, included Airlink founder John McGlynn, EnerMech chief executive Doug Duguid, Aberdeen businessmen Mike Wilson of Epic Group and Allan Porter of the Searoute Group. tweets: Tea and #indyref talk with Esraa at Popeyes in Portobello. Perhaps it might help if we took a little look at the pledge of more powers set out by the pro Union parties today. The one that was trailed last night by Gordon Brown and covered on the telly and the wireless. Firstly, it would appear to confirm the prime minister's acknowledgement that any notion of deferring the issue of more powers - conceptually if not yet in agreed detail - has been abandoned. No more talk of settling the question of independence then turning to more powers. The pro-Union parties have seemingly concluded that they must be more upfront, now, about their plans. Read Brian's full blog here. Ed Miliband had to abandon planned media interviews in Edinburgh's St James Shopping Centre when he was surrounded by a "melee of pro and anti independence supporters", according to the BBC's Norman Smith. It looks like voters in the referendum could enjoy a warm walk to the polling stations. There have been chaotic scenes in Edinburgh city centre as the Labour leader Ed Miliband attempted to do a walkabout amongst shoppers. Mr Miliband was surrounded by a melee of pro and anti independence supporters as he tried to walk through the St James shopping centre in Edinburgh. Planned interviews with the media had to be abandoned amidst the scrum. Mr Miliband played down the scenes as he struggled to meet any voters. He eventually had to be escorted out of a rear exit of the shopping centre. Another hectic day in the referendum campaign across the country. Newsdrive on BBC Radio Scotland now. Could the weather have a role in the referendum outcome? And would bad weather harm or favour one side more than the other? The BBC's Louise Sayers finds out. Karl, southern Iraq: I live on Tiree, Inner Hebrides, when not here. We now have a united Iraq, why does Scotland even contemplate breaking its unity with UK, it is mad. James, Glasgow: Yes won't be easy, of course it won't, but a bit of change is not scary enough for me to meekly accept all the flaws that we accept if we stay in the UK. We are a broken country, we are not at our best and Westminster is the cause of that, not the solution. Catalan language newspaper El Punt Avui has called Scotland's referendum process a "universal model". In an opinion piece titled "Scotland: An enviable example" the Barcelona-based paper says: "The Scottish process must from now on serve as a universal model to follow by other nations with similar aspirations. The article concludes: "No, Catalonia is not the same as Scotland, something which we know and lament, but the objectives are perfectly compatible as is the legitimacy of the aspirations of their respective citizens." Finlay Harris: I am not a nationalist, I am not a separatist...I just want to be independent and be allowed to make decisions for myself..
Stewart Forsyth: I think a lot of voters aren't considering the impact a Yes vote will have in 10-20 years time. And that's scary. Colletta Smith asks how the Scottish independence referendum is affecting the markets. An artist has set up his own "Scottish Border Agency" checkpoint near Jedburgh. Manchester-based Jon Parker Lees and a group of colleagues set up the spoof checkpoint "to try and take some of the anger out of the debate". He said: "We're not making a point for either side. We've staged this together as a group of Scots and English." 10 million interactions about the referendum have been logged in a five-week period, according to Facebook. The company's figures, covering 1 August to 8 September, suggest the "Yes" campaign has a narrow lead in terms of discussion. They cover comments, posts, likes and shares and 85% of them came from Scotland. Facebook is introducing a function that allows users to tell friends after they have voted in the referendum. David Cameron faces a Tory "bloodbath" over further devolution. The Week in Westminster in which he said there may be enough Tory MPs to block any additional powers going to the Scottish Parliament following a "No vote". SNP MP Angus Robertson said: "The Westminster revolt against any more powers for Scotland is up and running, and exposes the utter deceit at the heart of the No campaign that additional powers would follow a No." Leaders of the Confederation of British Industry (CBI) have appealed to voters in Scotland to reject independence. The heads of the business lobbying group's regions and nations council network and the organisation's president Sir Mike Rake said staying in the union was the best way to grow the economy. The CBI represents 190,000 businesses, which employ about seven million people. A leaders' statement said: "We want Scotland to stay in the United Kingdom and hope you vote to do so. We believe that the prosperity of all people in the UK would be best-served by Scotland remaining part of it." Press and Journal tweets: Scottish independence: Craft beer drinkers vote 'Yes'. A letter from David Cameron, Ed Miliband and Nick Clegg in the Daily Record pledged to retain the Barnett formula in the event of a "No" vote. Under the system, Scotland gets more spending per head than the UK average. Plaid Cymru leader Leanne Wood said the formula, determining how public cash is distributed, is unfair to Wales. Also visiting Lewis ahead of the Scottish independence vote has been Radio 5 Live's Nicky Campbell. He asked islanders how they feel about their identities and if this would affect their final decisions. Former prime minister Gordon Brown has been accused of "a spectacular own goal" over future funding of the NHS. Mr Brown said on Monday that new powers for the Scottish parliament in the event of a No vote must guarantee the power to spend more on the NHS if that is the wish of Scottish people. Health minister Alex Neil insisted Mr Brown had "inadvertently made the case for independence". He said: "If Westminster parties say that there should be an increase in taxes, they must say now which taxes and by how much. "We believe it would be far better to protect Scotland's budget before the Tories get the chance to cut it in the first place." Have to admit just accepted a Scottish tablet from lady in Yes office, Clydebank. Nanosecond impartiality lapse. Yes ppl are having fun. Dawn and Craig Cameron email: It's already the British AND IRISH Lions. New name may be a little lengthy but at least this is one concept already proven. Never know, we may even get some Scottish players picked next time. Julie Ford email: Currently care for older people is free if you live in Scotland, however this is not the case in England (there is a means tested assessed charge), how will this change if there is a YES vote? It is my understanding that the UK government currently subsides this free care? The boss of the energy company which operates Scotland's two nuclear power stations has told staff of continuing uncertainty about what independence would mean for the power sector. EDF Energy's chief executive Vincent de Rivaz said the company is not "policy neutral" and it is his responsibility to defend its interests. In an email sent to employees across the UK, Mr de Rivaz lists the key questions which will face the company in the event of a Yes vote. They include the regulation of the nuclear industry, the future of Britain's single electricity market and who would pay for the eventual decommissioning of the power stations at Hunterston and Torness. Energy minister Fergus Ewing said the Scottish Government has already set out its position on the issues raised. Press and Journal reports: "SNP environment minister Paul Wheelhouse and Scottish Green Party co-convener Patrick Harvie announced yesterday that an independent Scotland will bid to hold the annual UN climate talks. "The annual talks bring together world leaders and diplomats with climate experts to help tackle climate change. "This year's talks will take place in Lima, Peru, in December." Deputy First Minister Nicola Sturgeon has said a Yes vote on Thursday will help Scotland "secure jobs and opportunities for our young people" for years to come. On a visit to Steel Engineering in Renfrew, she said the powers of independence would prevent people having to leave Scotland to find work. She said: "If we have our hands on the levers of economic decision-making, if we have access to our own resources, then we are able to design an economic policy to suit our needs. "Too many young people in Scotland leave every year. Now, seeing the world is not a bad thing to do. But many people leave because they can't find a job and we need to do something about that." Rugby players from Stornoway, on Lewis, have been discussing how an independent Scotland might affect the future of the British Lions team. One said: "Whatever the outcome, we'll all still be friends the next day - hopefully". a potential £400m NHS funding gap means the health service is at risk under the SNP. She said: "This is a discussion document not a decision document. I'm part of a Government that has protected the revenue budgets of the health service and will continue to strive to do that. "It's a discussion document written in the context of the status quo, not in the context of independence." Gordon Brown adds: "Nobody should be told that they are any less patriotic or proud of their country. "I want the best for this country." Mr Darling adds: "Two days away and Alex Salmond is still refusing to answer basic questions about what independence would mean. He can't explain what would happen if firms start moving their headquarters away from Scotland, south of the border. "And they don't need to do this, they don't want to do this. They are being forced to do this because of the uncertainties created by Alex Salmond's lack of answers." Criticising Mr Salmond on the currency issue, Mr Darling says: "He can't even tell us what money we will be using two days before we go to the polls and it's not surprising that people are scared about that. "What could be more scary than not knowing what currency we would have if we vote for independence?" Gordon Brown says: "For months the Scottish National Party has said the issue is independence or no change. "For months we have been saying that the real way to change is not to separate off Scotland but to have a stronger Scottish Parliament. "Yes we need change but I think people are going to come to the conclusion what they want is the Scottish Parliament as part of the UK." in his blog that economists have no simple answer about how they should vote. "Here is the bad news if you haven't made up your mind whether to vote for Scotland to become independent - economic analysis cannot give you the answer. "That is partly because this dismal science is not capable of giving wholly (and sometimes even partly) accurate forecasts about the future prosperity of nations." Former Prime Minister Gordon Brown and Better Together leader Alistair Darling are speaking to activists in Clydebank. Mr Darling says: "We are never complacent but we go to the polls with growing confidence. "Because our argument that Scotland is better and stronger as part of the UK is an argument that is finding more and more support from the quiet majority in Scotland. That is why I believe we will win on Thursday." James Adams emails: It seems that we're now being offered a choice between Devo-max (awful name) and Independence lite. Both sides offering greater autonomy within a shared monetary, economic and trading union. Both promises require the backing of the UK government to work. Iain Steven, a small business owner, emails: A pledge, a vow, a Promise even a Contract, even signed by the political masters, BEWARE, even though they are the three party leaders, it is completely worthless. They are here representing the NO Campaign, NOT their parties. Tony and Oonagh Godfrey email: We are weary of the Murdoch inspired soundbites of the Yes campaign.eg - all is the fault of Westminster parliament or the views of business leaders who oppose Salmond's views are a set up by Cameron... We in England have no say in the matter. Surely in an unstable world we need to unite and not to return to a narrow nationalism. BBC Scotland's economics correspondent Colletta Smith looks at what new powers are being promised to Scotland whether there is a Yes or No vote. Dundee United chairman Stephen Thompson has given his backing for a 'Yes' vote on Thursday. Mr Thompson said he believed Scotland is "more than capable of being a successful independent country". He added: "A 'Yes' vote will allow Scotland to maximise its potential on the world stage. "One of our biggest exports and assets has been our people from all walks of life, social and political background - and one of the greatest challenges we face is to grow job opportunities so more of our brightest youngsters stay and work here in Scotland. "There is no one better placed to make the best of Scotland than the people of Scotland and no amount of negativity from the 'No' campaign or media can change that." As Scotland's historic vote on independence nears, Radio 5 Live's political correspondent John Pienaar presents a lively round up of the latest from the campaign trail. "Compare that [the pro-Union offer] with the revelations we've had today about funding threats to the NHS - policies and issues and decisions that the SNP has tried to keep secret during this campaign," she added. "We have got a campaign of lies from the SNP who are trying to tell us that the NHS is under threat when in fact it is under threat from the SNP administration." Shadow Scottish Secretary Margaret Curran has accused the SNP of "a campaign of lies" in the lead up to the referendum. joint pledge made by the pro-Union parties today had been discussed openly for "many months" and been "thoroughly investigated". And she insisted it was the SNP who were keeping things from the voters. Ms Curran said: "What is particularly new in this campaign is the guarantee of a timetable because we are absolutely sure in our commitment to the Scottish people that you'll get quicker, faster, more effective change with a 'No' vote compared to the risk and uncertainty you would get with a 'Yes' vote." Jim, Dunkeld: I run a small business, Scotland is made up of 70% small businesses, I had the self belief and confidence. I feel if there's a "Yes" vote it will bring self belief and confidence, it will encourage youngsters to go into business. James, Bearsden: I have no problem about who comes here, [but] where are all these people going to live? Housing will be overwhelmed. The day ahead for "No"
Labour leader Ed Miliband and former Prime Minister Gordon Brown will be on the campaign trail for Better Together in the central belt. Mr Miliband is expected to say: "The will of the people of Scotland for economic and political change has been heard and we will deliver. "Change is coming with more powers on tax and welfare for the Scottish Parliament. We will change the British state too, the House of Lords and the way we work together across our nations. "I ask the people of Scotland to lead that change of our whole British constitution." Business leaders have called for unity on Friday regardless of the outcome of the referendum. The Scottish Chambers of Commerce says, whatever the result, the country must work together to drive Scotland forward. The day ahead for "Yes"
Speaking ahead of a visit to apprentices at an engineering firm in Renfrew with Finance Secretary John Swinney, Deputy First Minister Nicola Sturgeon said: "Only a 'Yes' vote will ensure we have full powers over job creation - enabling us to create more and better jobs across the country. "So instead of almost 40,000 young people leaving Scotland each year as is currently the case, there will be more opportunities for our young people here at home." Ms Sturgeon will then join carers to talk about the NHS and welfare reform. She added: "With a 'Yes' vote we can ensure our NHS is protected for future generations by enshrining it in our written constitution." In reply to Gladys from Aberdeenshire on Morning Call, James in Edinburgh emails: It is a valid point to ask if the Scottish government can set up all the departments needed. There won't actually be that many needed as the Scottish government already has most departments either set up or other departments able to take on the tasks. In reply to Paul from Dunblane on text, Neil from Falkirk emails: Scotland has voted for the Westminster government 14 times out of the last 21 elections, not bad for a country who never gets the government the majority vote for. the front pages of Scotland's papers today. The leaders of the three main parties at Westminster have signed a pledge to devolve more powers to Scotland if it votes "No". David Cameron, Ed Miliband and Nick Clegg's agreement appears on the front of the Daily Record. The Herald says the PM would be "heartbroken" if Scotland leaves the UK, while the the Scottish Sun sees a possible omen for Thursday's poll in a cloud, shaped like a map of the UK - but without Scotland. Alison, Glasgow: Of course Scotland will be outward looking! We want to be part of the world on our own terms, not via Westminster, whose reputation has been tainted by illegal wars and intransigence in the EU. As Winnie Ewing said - "stop the world, Scotland wants to get on!" Ella in Dundee: So many unanswered vital questions. Lets say NO this time but come back and ask again when we have clear detail on finance etc. suggest a radical cost-saving plan will be implemented in the Scottish NHS after the referendum. The papers were passed to the BBC and The Herald by a senior NHS whistleblower, who said they had become frustrated by the argument of the "Yes" campaign that the biggest threat to the NHS comes from the UK government. They were presented to a meeting of health board chief executives and civil servants last month and suggest the NHS is facing a £400m funding gap. Speaking to the BBC this morning, First Minister Alex Salmond described the £400m funding gap claim as "absolutely untrue". "Our plans show a real-terms increase in spending - the first time the health service budget has ever passed the £12bn mark," he added. Sandy, Ayrshire: I am voting Yes. One of the main reasons for voting Yes is saying goodbye to the Westminster system of politics. I am completely disillusioned. I am not voting Yes blindly. Gladys, Aberdeenshire: An independent Scotland will have to set up all the departments to collect all the taxes, pay all the pensions, benefits, defence. They are promising to have all this set up in 18 months - is this possible? Earlier we featured a photograph of how of Holyrood is facilitating the world's media. There probably aren't that many people out there who are wholly undecided in the sense that they really are not clear at all whether they are going to vote 'Yes' or 'No'. Really, the battle is not so much about getting people who have no idea at all - there aren't too many of those - but rather those people who have got an inclination but they're still wavering. It's to persuade those people to go in one direction or the other. Irene, Brighton. What happens if it's a dead heat? Pistols at dawn with Salmond and Cameron? That I would pay good money to see! Paul, Dunblane: The basic tenet of democracy is that a nation gets the government it votes for. Scotland has not been a democracy for 300 years. A Yes vote changes that. A No vote and we cease to be even a country. Larissa, Fife: I feel we are guinea pigs in Mr Salmond's experiment. An experiment that has so many extraneous variables that it is not safe to run. John, Stirling: Surely what is now being offered should have been there BEFORE polling started? Almost 25% of electorate have already voted. Mr Salmond concluded: "I think no-one seriously thinks that this land is not capable of running its own finances. "All of the scaremongering is going to fall on deaf ears. We have a once-in-a-lifetime opportunity." Mr Salmond describes the pledge signed by the leaders of the three main Westminster parties that there will be more powers for the Scottish Parliament as the "mythical package of nothing". Asked whether an independent Scotland would have to pay more to borrow money, the first minister replies: "No, you have to have sustainable level of borrowing and debt. As far as the cost is concerned, we'll be borrowing at Sterling rates." Asked why many companies and financial experts are criticisng plans for a an independent Scotland, Mr Salmond replies: "Many economic experts take a different view," and mentions Nobel prize-winning economist Joseph Stiglitz, who recently criticised the "scaremongering". He claims the Scottish government is building "better schools and better hospitals" through capital funding, rather than having money "creamed off" by private companies in PFI arrangements. First Minister Alex Salmond is live on Good Morning Scotland. Responding to Alistair Darling's claim that the SNP is cutting NHS funds and there is a £400m funding gap, Mr Salmond says this is "absolutely untrue". "Our plans show a real-terms increase in spending - the first time the health service budget has ever passed the £12bn mark," he adds. Good Morning Scotland has been reporting from the Borders this morning. Bob Burgess, deputy editor of local newspaper the Southern Reporter, said the question of boundaries and currency had been among the key issues for people in the area. He told Gary Robertson: "We have had to expand our letters pages quite dramatically." Coming up, have you seen or heard anything specific which has helped you decide how you are going to vote in the referendum? From the economy to health, from business to currency, let's have your questions and your comments. Darling: "What you have is an undertaking. A promise. That if we say no to independence we will get the change most people want"
Darling struggling to explain how pro union parties can "guarantee" powers other than "will be an awful lot quicker" than independence. Good Morning Scotland after 08:30. You can listen to the programme at the top of this page. Speaking about the nature of the campaign, Douglas Alexander said: "This campaign has both energised Scotland and it has divided Scotland. There's a heavy burden of responsibility on everyone involved in this campaign to conduct ourselves in a manner that means on Friday morning, whatever the result, we can bring Scotland together and we can move Scotland forward. I hope that is an approach that will be taken by everybody." Mr Darling told BBC Scotland: "You can have a stronger, more secure Scottish Parliament. "Why on earth break up the entire thing? If we vote to leave, if it all goes wrong, we can't go back." The poll also finds that 56% of those who responded would be "saddened" if Scotland votes to be independent. Labour MP Douglas Alexander has dismissed Yes campaign claims that independence is the only way to get the government Scotland votes for. On BBC Breakfast he said: "I've got two governments that I didn't vote for and didn't support. I've got a Scottish National Party government in Edinburgh and I've got a Conservative-Liberal government in Westminster. So the only way you always get the government you vote for is in a one-party state and I don't think anybody is recommending that." Alistair Darling, campaign leader of Better Together, has been speaking about the NHS this morning. He told Good Morning Scotland: "What we are saying is if we vote No, work will start on Friday morning on increased powers, particularly to raise additional funds. "You can have a stronger more secure health service if we vote No. "The Scottish Parliament has the power to spend money, it will have the power to raise additional money, it can borrow more." Ms Sturgeon added: "They [the pro-Union parties] are treating voters in Scotland with contempt." Asked if a "Yes" vote guarantees "better lives" for people in Scotland, she replied: "Independence is not a magic wand, but it is a massive opportunity. "We can make life better, not overnight, but over time." Deputy First Minister Nicola Sturgeon has been responding to the offer of new powers put forward by the pro-Union parties. Speaking on BBC Breakfast, Ms Sturgeon said: "If there was a serious intention to deliver more powers, why hasn't that happened before now? "Tory MPs, including Christopher Chope, have already said they would block more powers. If we vote No, there are no guarantees at all." Asked if the move smacks of panic, Mr Alexander told BBC Breakfast: "I don't think there's any embarrassment about placing policies on the front page of papers with just days two go. "I think the 'Yes' campaign are struggling. They had an avalanche of facts engulfed in assertions last week when it was announced every major Scottish bank would move their registered office to London. "The economic risks suddenly became very real last week, and at the same time we are offering what I believe most of us here in Scotland want which is faster, safer and better change." "That pledge, that vow that we can have faster, safer, better change is actually a vision around which Scotland can unite," he adds. Shadow Foreign Secretary Douglas Alexander has denied the powers pledge made by the pro-Union parties has come too late in the referendum debate. Mr Alexander told the BBC: "Here in Scotland, we have been talking about these powers for many months. What we are saying today is we can have the best of both worlds. We can have a stronger Scottish parliament but with the strength, stability and security of the United Kingdom." J S Crieff: Vote no for stability not this daft idea of independence. The Yes campaign claims the offer of further devolution signed up to by the leaders of all three main Westminster parties would give Scotland the power to raise only 30% of its taxes. The problem all along, and this is what people would tell you privately in the "No" campaign, is that there is a very sharp argument between independence and all the risks it brings and staying with the UK. What they didn't do early enough, some of them would say, is put forward the alternative. They came up with a phrase which they used back in June when they said '"No" doesn't mean no change'. But they weren't clear what the change would actually be. Now they are emphasising it, now it's on the front page of a tabloid and some people think perhaps they've left this a little bit too late. And certainly it's quite difficult if you're using complicated arguments to get through to people who are first time voters, 16-year-olds, who have never voted in their life before. email us here or text 80295. If you are texting, don't forget to include your name and where you come from. With the referendum just two days away, the world's media is intensifying its gaze on Scotland. At the Scottish Parliament in Edinburgh, preparations are under way to host hundreds of journalists and news crews from around the globe. A broadcast village with flood lights and scaffolding two storeys high has been erected in the grounds around Holyrood. From here, reporters will broadcast live. Calum Kerr, of Yes Scotland Borders, told Good Morning Scotland: "Bit by bit I have become massively involved. It's people that have never been interested in politics, they see a genuine opportunity for change. "It's a different challenge here, the proximity of the border adds an intensity. "A girl said we rely on England - the Morrisons is just across the border. You will still be able to go there." Scotland's desire for political and economic change has been heard and will be delivered, Ed Miliband will promise today. The Labour leader will insist a "vote for 'No' is a vote for change". Meanwhile, rival campaigners will argue independence would bring either a "golden opportunity" or "separation and risk". With just 48 hours until voters go to the polls, Deputy First Minister Nicola Sturgeon and Finance Secretary John Swinney will be talking to apprentices in Renfrew. Liberal Democrat MPs Charles Kennedy and Danny Alexander will be joined by MSP Willie Rennie to highlight "the positive things that Scotland and the UK have achieved together". Shadow Foreign Secretary Douglas Alexander will be campaigning in Edinburgh's financial district. Good Morning Scotland has been speaking to campaigners in the Scottish Borders on both sides of the independence debate. Michelle Ballantye, for Better Together, told BBC Scotland: "I think it's a bit of a nonsense we need to be independent to be fairer. "I think the Borders has a strong sense of being part of the UK. Our sense of connection is very strong." The leaders of the three main Westminster parties have signed a pledge to devolve more powers to Scotland if there's a No vote. The pledge has been signed by David Cameron, Ed Miliband and Nick Clegg and appears on the front of the Daily Record newspaper. It includes promises of "extensive new powers" for the Scottish Parliament. Prime Minister David Cameron has denied the move is a panic measure. He said: "I always said right from the start of this campaign, if Scotland voted 'No' to separation, the rest of the United Kingdom would say 'Yes' to further devolution. "And of course that wasn't just my view; that was the view of the leaders of other United Kingdom parties who all thought it was important. Let's settle the question of separation and then look at devolution." Good morning and welcome to Referendum Live, your minute-by-minute guide to all today's news, comment and analysis from both sides of the campaign. With just two full days of campaigning left, and with the polls so close, the stakes couldn't be higher.